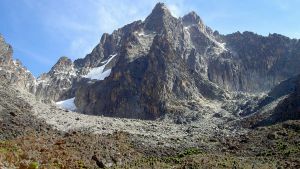 The Old moses campsite of mount Kenya is the first campsite encountered while climbing the mountain using the Sirimon route and is located about a few hours trek from the Sirimon gate. The campsite is one of the few that are accessible by both vehicle and hiking, with a dirt road ending right at its location. It is was formerly known as Judmier camp and is privately owned and run. The campsite features several wooden cabins, with sleeping arrangements in the form of dormitory styled houses, with each room having several bunk beds. Apart from that, there is one large communal dining hall, a kitchen, with running cold water available at its facilities. All toilets are W.C's located indoors, within the same buildings as the accommodation rooms. 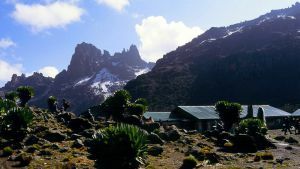 Hikers using the campsite would have the option of either using the rooms available (pre booking required) or sleeping in their own tents at the campsite nearby. Most of the people that you would see here are either those ascending to Shipton's camp (and point Lenana) using the Sirimon route, or those descending to the Sirimon gate. For this reason the campsite is larger and does see slightly higher traffic than its fellow Shipton camp - that is only used by those ascending. 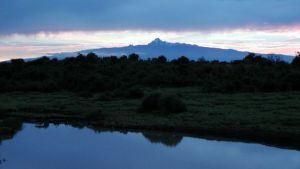 The Old moses campsite is located at the end of a dirt road, just a short distance from the mountain's rainforest and the early stages of the moorland zone. Most of it's surrounding vegetation consists of open scrubland with spectacular plants, including lobelias. There also are quite a few animals to spot here, with the smaller rodents and birds being more common. From here, the next campsite is Shipton's normally requiring one of the longest hikes of the route to get there, going through the beautiful mackinder's valley along with several rivers. Are you associated with Old Moses (judmier) campsite? Contact us to improve this page or create another page for your business.